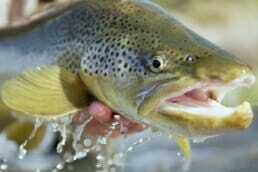 The Victorian Minister for Agriculture Jaala Pulford announced changes today to recreational fishing rules for trout. Previously there have been no minimum size limits for trout in Victoria and the new rules signify a recognition of the significance of recreational trout fishing to the community. The introduction of a minimum size in the four rivers will help promote these waters as high quality trout fishing destinations. The changes are expected to produce more trophy trout in the two lakes, both of which are stocked annually with yearlings grown at the Victorian Fisheries Authority’s Snobs Creek hatchery, funded largely by fishing licence fees. The removal of the closed season in the Merri and Hopkins rivers will give anglers year-round access to stocked populations of brown trout, some of which grow to more than 2kg. The announcement coincides with the opening of the Victorian trout season this weekend, with free Trout festivals kicking off at Eildon and Ballarat.